Since the White Witch’s appearances in the first half of 2006, following the release of The Lion, The Witch and The Wardrobe, Backlot has been the unlikely home of a little slice of Narnia magic — the frosty throne from her spectacular ice palace, housed within a covered black box as if a piece of the film set had been cut away and lifted here. To the side of the scene stands a figure of the Witch’s old assistant, Ginarrbrik. We recently asked in our Question of the Week, “Which of the 2008 Disney Character would you most like to meet at Disneyland Resort Paris?”. Whilst an overwhelming majority of 79 votes to 21 voted for Pixar’s cute little waste-cleaning robot WALL-E to debut, the incredibly low likelihood of this means that, in reality, Prince Caspian has probably just won the competition. 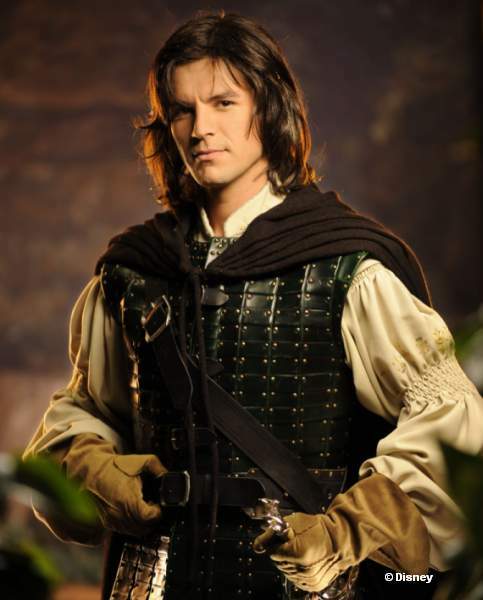 The new Prince Caspian is certainly a rather dashing figure of royalty, and surprisingly close to the Ben Barnes original as seen in the film. Whilst using the same costume of a green armour, black cape, brown boots and gloves and green sword sheild as the character, the Paris equivalent is rather more fresh-faced than the prince recently debuted over at Disney’s Hollywood Studios in Florida. As Prince Caspian signed autographs for the first time this weekend, soon the reasoning behind keeping the ice palace scene in place — rather than replacing it with, for example, something like the overgrown ruins set used in Hong Kong — became clear. Not only has Prince Caspian debuted at Walt Disney Studios Park, the infamous — and very popular — White Witch has returned! Her icy glare is just as startling as ever, returning the exceptional costume introduced in 2006 to the park, complete with brilliant white (fake) fur coat, crystal-blonde locks, frosted crown and an icy staff. Note also the speckles of frost running down her cheeks, and the tiny white icicles on her eyelids. The new guy Prince Caspian is going to have some competition for those autographs this Summer. Exact times of the character appearances are not included in the regular park Programme leaflet, likely due to the small availability of these cast members that also affected the early appearances of Jack Sparrow. Keep an eye out next time you’re in Backlot, though — you never know when the door to Narnia might open. Sooner than we thought, anyway — even if this isn’t yet the full attraction as rumoured recently. The Chronicles of Narnia: Prince Caspian is released in the UK tomorrow, 26th June 2008. Well I like that character from disneyland. He’s cute and he is look like Ben Barnes played by Prince Caspian from the movie. Well Prince Caspian is the different like Walt Disney World Journey Into Narnia because I like Caspian in Orlando. He’s hot and another guy from Disneyland, He’s Hot too!